Seemingly born overnight, a World Wide Rave happens when collectively, your product, your brand or heck, you are instantly known the world over. Most of the time they are accidental. But what if you could create one? How valuable would that be to you? Priceless? You can. The secret is here. By harnessing the power of social media and learning the secrets of leveraging the magnitude of resources like YouTube, Facebook, and blogs, you can drive eager buyers to your virtual doorstep—virtually for free. 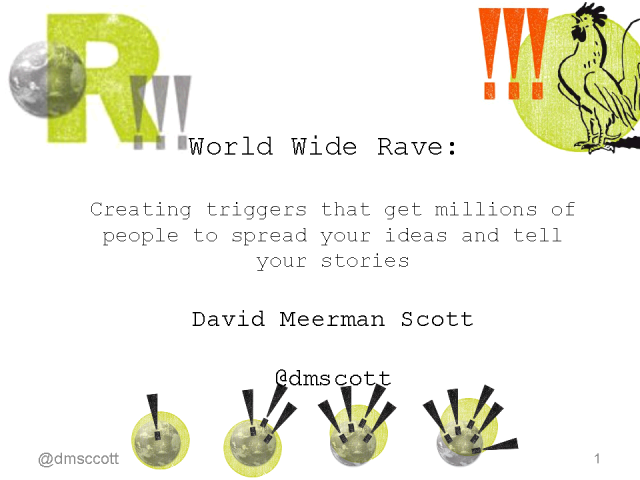 In this engaging discussion, Scott author of the hit new book World Wide Rave, and of the award-winning BusinessWeek bestseller The New Rules of Marketing and PR, reveals the most exciting and powerful way to build your own giant audience from scratch. Told with many case studies and real-world examples, a practical discussion about the new reality of PR and marketing.